warner | portraits | goldsboro, n.c. Sometimes, time flies outrageously fast...like Warner growing up. One day, this little man was spitting up in my lap and the now he's leading horses around a pasture like a pro! I can't believe that he is already 5-years-old. I've been photographing him since he was in the womb, and from Halloween parties, 4th of July celebrations, + Easter Egg hunts Warner has become one of my best buddies + we always have A. LOT. OF. FUN! Needless to say, he's basically the coolest neighbor in the world. 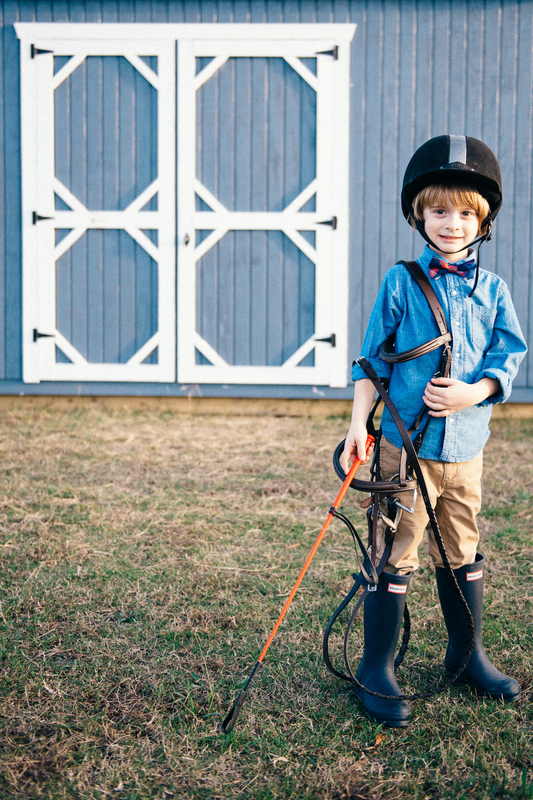 This year, Warner's love for horses spurred the inspiration for this session. He helped feed the horses, freshen their hay, lead them around the pasture, + get their reins on and off. His knowledge of horses at 5-years-old is outstanding. At one point, he looked at me while the horses were munching on grass and says, "Miss Lauren, did you know horses are herbivores?" He even knew what "herbivore" meant! He even asked great questions about how the horses wear their teeth down and whether or not it would be cold enough to let them wear their blankets for the night. Thanks for letting me photograph Warner the 5-year-old horse genius! engaged: philip + danielle | burlington, n.c. When Philip + Danielle contacted me about doing their wedding photos, I squealed with excitement! Philip and I were friends back in high school, where we spent days convincing our AP European History teacher to let us watch any movie that had to do with Europe and play Risk, along with surviving many other "challenges" of high school. I was so happy for him when we went to N.C. State and even happier that he met this awesome lady, Danielle while he was there! When I say that I couldn't think of any other people who were absolutely perfect for each other, I truly mean it. Philip is a Ph. D candidate in the College of Veterinary Medicine at State and Danielle is a veterinary medicine student and a Ph. D candidate. They just get each other. Their love for each other is huge! They laugh at each other and themselves and are all about caring for animals in such a very intellectual way. Phil proposed to Danielle late this summer while she was at school. A good friend convinced her that there was a sick goat out in the field by a big tree that needed attention quickly. Little did she know, the sick goat was Philip. Philip took a knee and Danielle's breath away in one fell swoop while she was decked out in her mud boots and overalls. It was a total surprise, which always makes for the best proposal! We met out at their wedding venue in Burlington, Starlight Meadows, to have a rustic and casual session. This new venue is awesome and is going to be so beautiful on an early October evening! We played and danced in the meadow with their sweet boy, Finley, laughed at all the things, and had such a great time. These two even cracked jokes the whole day about some pretty gross cow facts (I'll spare you the details but I quite enjoyed them myself! ), in addition to owning all awkwardness and quoting YouTube videos. They are an adventurous couple who know how to have some serious fun and are dream clients! Philip + Danielle, you two are just so perfect for one another. It brings butterflies to my stomach when I see how much love there is beaming out of y'all. Thank you for the great session and I cannot wait for the big day to get here! senior portraits: evan | goldsboro, n.c.
Evan. An athlete. A smart pants. A super hero. An aspiring fighter pilot. This kid is on top of the world, y'all (or will literally be when his dream of becoming a F-22 fighter pilot come true). Evan used to be my neighbor in Seymour Johnson's base housing back in the late 1990's. He and my brother were total bros and would rule the trampoline, mummify G.I. Joes, and carve their names into everything. When Evan's mom asked me to do his senior portraits, I had no idea he was getting ready to graduate! I still saw him as my younger neighbor who was crazy strong for 4-years-old. For his portraits, we ventured out to some of Goldsboro's iconic places including Seymour Johnson Air Force Base to see the planes-on-a-stick. It was a very foggy Veteran's Day morning, which made this session inspiring but also nostalgic as the jets appeared to be shooting out of the sky, it seemed. Evan is on his way to do awesome things with his life. He's at the top of his class and aspires to go to the Air Force Academy (finger's crossed that he gets in! ), he's a top wrestler and football player at his school, he wants to study aerospace engineering in school, he's not afraid to be a goofball, and he has a clear passion for his superheroes (seriously, he's got the best superhero wardrobe in the world), and could be a model if all else fails. But on top of all these accolades, he's a genuinely wonderful big brother who is super chill and super patient, a great son, and a big dreamer who loves his country. Evan, good luck with all your life endeavors and I hope your ride to the top is a spectacular adventure!